Frank Bruckmann, will paint a seascape in oil at the next meeting of the Watertown Art League at 7 pm Monday November 8, 2010 at the First Congregational Church meeting room, 40 Deforest St., Watertown, Ct. Everyone is welcome to this free presentation. Frank, a prominent painter, studied in Paris at the Ecole des Beaux Arts Academy. 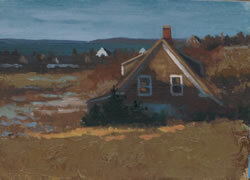 After returning the US in 1990, he discovered the very paintable CT shoreline. He spent most of last year on Monhegan Island, an island off the coast of Maine that has drawn artists since the mid 19th century. 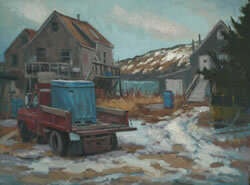 His art work, is done primarily in oil plein air. Frank enjoys sharing his knowledge and his passion for this medium which is reflected in his work. An award winning artist, he is represented in many prominent galleries. A treat to watch, be sure to come and enjoy. For additional information on Frank visit www.fbruckmann.com. The Watertown Art League meets the 2nd Monday of the Month at The First Congregational Church meeting room. The League maintains a 30 year history of providing informative open meetings/demonstrations, and successful art shows. Meetings are always open to the public and are free. Visit our web site for directions, membership forms and information. http://run.to/WAL or call May at 203-574-2835.